This lesson plan was crafted by PhET teacher-fellows specifically to accompany the Flash simulation Projectile Motion. It is quite comprehensive, providing both teacher and learner with appropriate support to learn about projectile motion with or without air resistance. 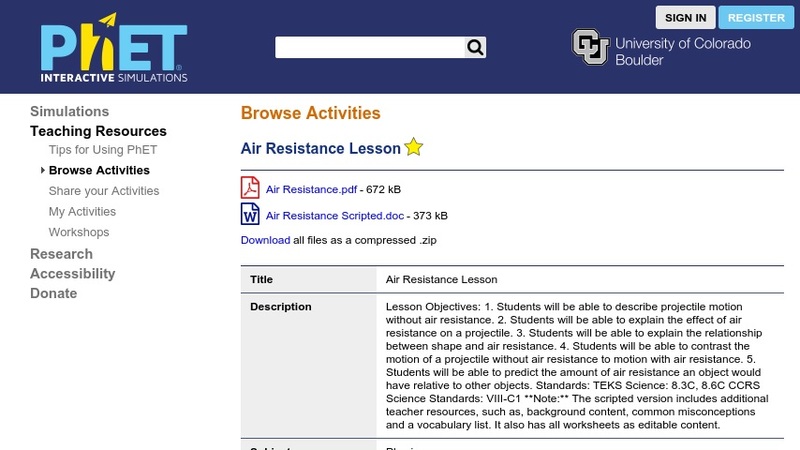 It contains scripted teacher discussion, background information, explanations of fluid properties of air and coefficient of drag, common misconceptions, and modifiable worksheets. The simulation must be open and running to complete this activity. Allow two class periods. This resource is part a large collection of interactive simulations developed by the Physics Education Technology Project (PhET). The Projectile Motion simulation has been classroom-tested.